My interest in psychosis research began after college, when I was hired as a research assistant within the U.S. Department of Veterans Affairs. One of the most fulfilling aspects of this job was that it gave me an opportunity to talk to individuals with schizophrenia and learn about their lives. These personal stories inspired my interest in the initial stages of psychosis, when early intervention efforts may serve to ameliorate symptoms, prevent illness progression, and/or curtail negative sequel associated with long-term illness. I found research in early psychosis to be hopeful, and thus I decided to apply to work with Dr. Jason Schiffman in the clinical psychology program at UMBC. In my time at UMBC, I have developed a passion for research focused on understanding early psychosis. My thesis and dissertation research has focused on screening for psychosis-spectrum symptoms among help-seeking individuals, and identifying those with a heightened risk for psychosis who may benefit from symptom monitoring and/or specialized treatment. 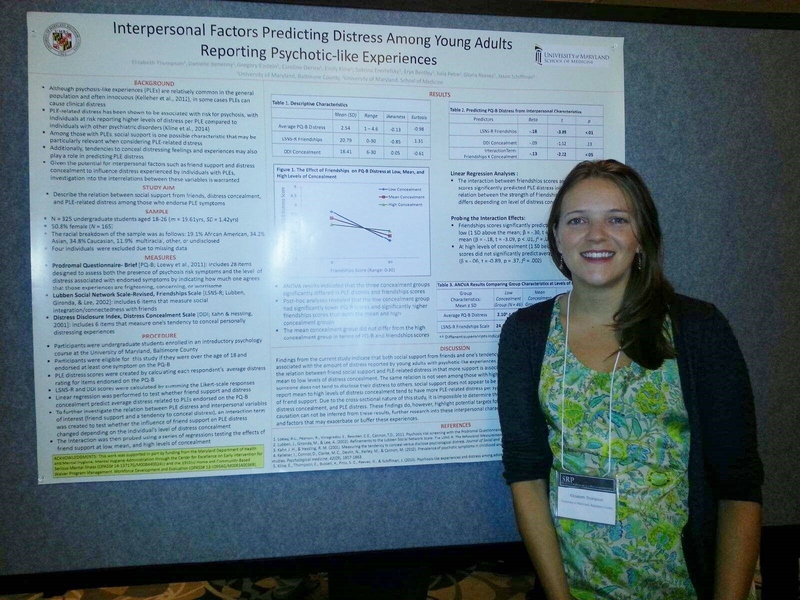 Throughout my time as a graduate assistant, I had the honor of helping to build our lab’s research project into an important clinical service for providers throughout Maryland seeking diagnostic clarification and/or specialized evaluation for adolescents and young adults experiencing potential psychosis-spectrum symptoms. Over the past few years, this initiative has gained recognition from the state and expanded into the Maryland Early Intervention Program’s Strive for Wellness Clinic, a consultation and treatment service for individuals at risk for psychosis. Currently, I am completing my pre-doctoral internship through the Clinical Psychology Training Consortium at Alpert Medical School of Brown University. Throughout the training year, I will be providing mental health services to youth and families through Bradley Hospital, a pediatric and adolescent mental health care system in Rhode Island. My clinical rotations are in a community-based therapeutic school, an adolescent inpatient unit, an intensive obsessive-compulsive disorders program for youth, and a children’s partial hospital program. 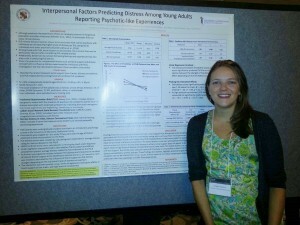 In addition to my clinical work, I have the opportunity to expand my psychosis research while on internship. In collaboration with my mentors at Brown, my research objectives include exploring the occurrence of psychosis-spectrum symptoms among adolescents in an acute care setting, and describing the relation between these symptoms and other clinically relevant concerns related (e.g., depression, anxiety, suicidality). My long-term goals center on continuing to improve the field’s understanding of prodromal symptoms and expanding early intervention services available to individuals at risk of developing psychosis.